At our practice, Grand Central Foot Care, we treat a lot of heel pain or plantar fasciitis. Many of the symptoms include pain when you first get up in the morning, burning, numbness and increased symptoms by the end of the day. The pain is usually caused by the tightening of the plantar fascia ligament located on the bottom of the foot. The plantar fascia ligament supports the arch. When you're resting, the ligament contracts. As you start to walk, the ligament pulls and may tear slightly causing pain. Heel pain can also be brought on by trauma, overexertion, ill-fitting shoes or poor foot alignment. Proper foot support is one of the most important treatments we recommend. The purpose of foot support is to stop the ligament from tearing, thereby, getting at the cause of the problem. We often prescribe custom orthotics for the best possible foot support. Custom orthotics are inserts that fit into your shoes, which are custom molded specifically to your foot, to correct the faulty foot alignment and bring your foot into a more correct position. We find that most of our patients respond to conservative treatment with favorable outcomes. For those patients that require additional treatment surgery may be necessary. So, if you're suffering from heel pain, don't wait for it to become a chronic problem. Schedule an appointment with our heel pain specialists today for a complete evaluation. Achilles tendinitis is a medical condition that causes pain along the back of the leg near the heel. This happens when the Achilles tendon is constantly abused. This condition is common among athletes and middle age people who are actively engaged in sports activities. Surgery may be needed if the symptoms do not improve. It is best to consult a podiatrist or foot specialist for him to assess the severity of the condition and select the best procedure to repair the Achilles tendon. Schedule an appointment today with Grand Central Foot Care for a comprehensive evaluation. A broken bone is also known as a fracture. There is a common misconception that a broken bone is worse than a fracture. In reality, they are the same. There are many different types of fractures or breaks. Contact us if you or someone you know has sustained an injury to the foot or ankle we will make every attempt to see you ASAP, usually the day you call. In our practice, we utilize the latest technology to determine if there is a fracture, dislocation or torn ligaments. If you've sprained your ankle or have a history of ankle sprains, early evaluation and aggressive treatment is the best way to avoid chronic pain, instability and arthritis of the involved joints. 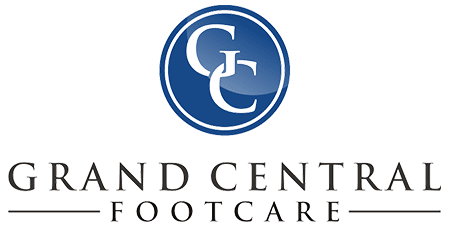 Schedule an appointment with Grand Central Foot Care immediately to be evaluated and to learn more about all of your treatment options.